Characterised by its ease-of-use, speed and image quality, InnoScan 710 is the ideal tool for routine microarray reading. with its patented XY motorisation, the InnoScan 710 is the fastest scanner on the market with adjustable reading speed from 10 to 35 lines per second (capable of scanning slides at 10 μm/pixel in less than 3.5 minutes ). with a bar code reader, InnoScan 710 provides accurate control of acquired images. InnoScan 710 is supplied with a validation slide and associated Mapix software that verifies scanner performance. 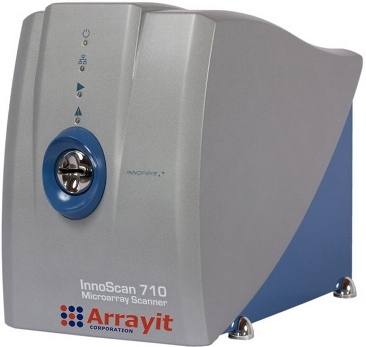 InnoScan 710 is a low cost, portable scanner capable of reading medium density microarrays at a maximum resolution of 3 µm/pixel.